It was out of the so-called heliolithic, culture we have described in Chapter 12.3 that the first beginnings of anything that we can call a civilization arose. It is still doubtful whether we are to consider Mesopotamia or Egypt the earlier scene of the two parallel beginnings of settled communities living in towns. By 4,000 B.C., in both these regions of the earth, such communities existed, and had been going on for a very considerable time. The excavations of the American expedition at Nippur have unearthed evidence of a city community existing there at least as early as 5,000 B.C., and probably as early as 6,000 B.C., an earlier date than anything we know of in Egypt. The late Mr. Aaron Aaronson found a real wild wheat upon the slopes of Mt. Hermon, and it must be that somewhere in that part of the world its cultivation began. It may be that from the western end of the Mediterranean, possibly in some region now submerged, as a centre that the cultivation of wheat spread over the entire eastern hemisphere. But cultivation is not civilization; the growing of wheat had spread from the Atlantic to the Pacific coast with the distribution of the Neolithic culture by perhaps 15,000 or 10,000 B.C., before the beginnings of civilization. Civilization is something more than the occasional seasonal growing of wheat. It is the settlement of men upon an area continuously cultivated and possessed, who live in buildings continuously inhabited with a common rule and a common city or citadel. For a long time civilization may quite possibly have developed in Mesopotamia without any relations with the parallel beginnings in Egypt. The two settlements may have been quite independent, arising separately out of the widely diffused Heliolithic Neolithic culture. Or they may have had a common origin in the region of the Mediterranean, the Red Sea, and southern Arabia. The first condition necessary to a real settling down of Neolithic men, as distinguished from a mere temporary settlement among abundant food, was of course a trustworthy all-the-year round supply of water, fodder for the animals, food for themselves, and building material for their homes. There had to be everything they could need at any season, and no want that would tempt them to wander further. This was a possible state of affairs, no doubt, in many European and Asiatic valleys; and in many such valleys, as in the case of the Swiss lake dwellings, men settled from a very early date indeed; but nowhere, of any countries now known to us, were these favourable conditions found upon such a scale, and nowhere did they hold good so surely year in and year out as in Egypt and in the country between the upper waters of the Euphrates and Tigris and the Persian Gulf. Here was a constant water supply under enduring sunlight; trustworthy harvests year by year; in Mesopotamia wheat yielded, says Herodotus, two hundredfold to the sower; Pliny says that it was cut twice and afterwards yielded good fodder for sheep; there were abundant palms and many sorts of fruits; and as for building material, in Egypt there was clay and easily worked stone, and in Mesopotamia a clay that becomes a brick in the sunshine. In such countries men would cease to wander and settle down almost unawares; they would multiply and discover themselves numerous and by their numbers safe from any casual assailant. They multiplied, producing a denser human population than the earth had ever known before; their houses became more substantial, wild beasts were exterminated over great areas, the security of life increased so that ordinary men went about in the towns and fields without encumbering themselves with weapons, and among themselves, at least, they became peaceful peoples. Men took root as man had never taken root before. But in the less fertile and more seasonal lands outside these favoured areas, in the forests of Europe, the Arabian deserts, and the seasonal pastures of Central Asia, there developed on the other hand a thinner, more active population of peoples, the primitive nomadic peoples. In contrast with the settled folk, the agriculturists, these nomads lived freely and dangerously. They were in comparison lean and hungry men. Their herding was still blended with hunting; they fought constantly for their pastures against hostile families. The discoveries in the elaboration of implements and the use of metals made by the settled peoples spread to them and improved their weapons. They followed the settled folk from Neolithic phase to Bronze phase. It is possible that in the case of iron, the first users were nomadic. They became more warlike with better arms, and more capable of rapid movements with the improvement of their transport. One must not think of a nomadic stage as a predecessor of a settled stage in human affairs. To begin with, man was a slow drifter, following food. Then one sort of men began to settle down, and another sort became more distinctly nomadic. The settled sort began to rely more and more upon grain for food; the nomad began to make a greater use of milk for food. He bred his cows for milk. The two ways of life specialized in opposite directions. It was inevitable that nomad folk and the settled folk should clash, that the nomads should seem hard barbarians to the settled peoples, and the settled peoples soft and effeminate and very good plunder to the nomad peoples. Along the fringes of the developing civilizations there must have been a constant raiding and bickering between hardy nomad tribes and mountain tribes and the more numerous and less warlike peoples in the towns and villages. For the most part this was a mere raiding of the borders. The settled folk had the weight of numbers on their side; the herdsmen might raid and loot, but they could not stay. That sort of mutual friction might go on for many generations. But ever and again we find some leader or some tribe amidst the disorder of free and independent nomads, powerful enough to force a sort of unity upon its kindred tribes, and then woe betide the nearest civilization. Down pour the united nomads on the unwarlike, unarmed plains, and there ensues a war of conquest. Instead of carrying off the booty, the conquerors settle down on the conquered land, which becomes all booty for them; the villagers and townsmen are reduced to servitude and tribute paying, they become hewers of wood and drawers of water, and the leaders of the nomads become kings and princes, masters and aristocrats. They, too, settle down, they learn many of the arts and refinements of the conquered, they cease to be lean and hungry, but for many generations they retain traces of their old nomadic habits, they hunt and indulge in open-air sports, they drive and race chariots, they regard work, especially agricultural work, as the lot of an inferior race and class. This in a thousand variations has been one of the main stories in history for the last seventy centuries or more. In the first history that we can clearly decipher we find already in all the civilized regions a distinction between a non-working ruler class and the working mass of the population. And we find, too, that after some generations, the aristocrat, having settled down, begins to respect the arts and refinements and law abidingness of settlement, and to lose something of his original hardihood. He intermarries; he patches up a sort of toleration between conqueror and conquered; he exchanges religious ideas and learns the lessons upon which soil and climate insist. He becomes a part of the civilization he has captured; and as he does so, events gather towards a fresh invasion by the free adventurers of the outer world. We shall use ” Mesopotamia” here loosely for the Euphrates-Tigris country generally. Strictly, of course, as its name indicates, Mesopotamia (mid- rivers) means only the country between those two great rivers. That country in the fork was probably very marshy and unhealthy in early times (Sayce) until it was drained by man, and the early cities grew up west of the Euphrates and east of the Tigris. 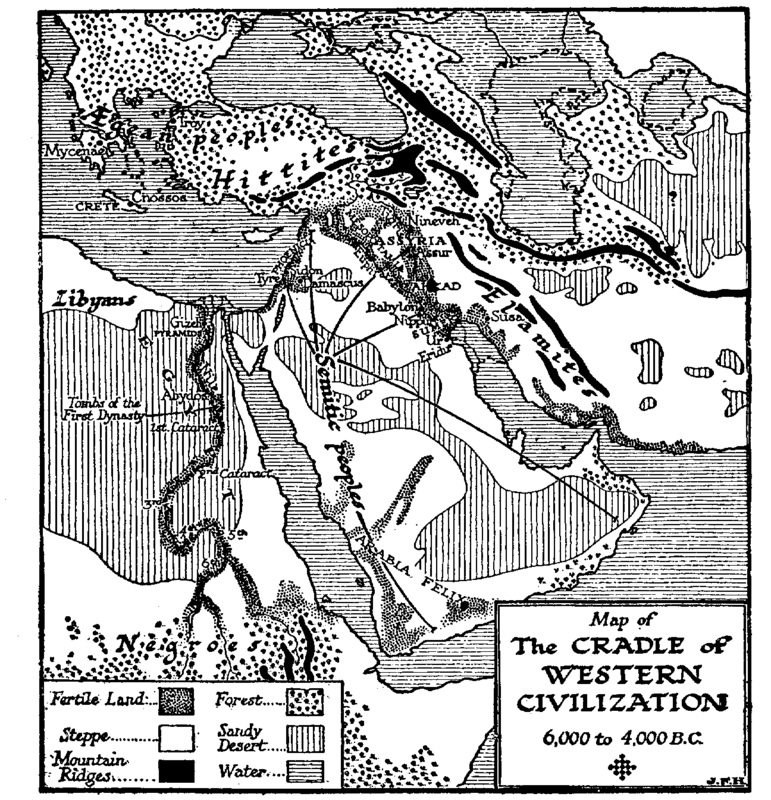 Probably these rivers then flowed separately into the Persian Gulf.